There are many great walks around the apartment at Clifton Court, but it’s hard to beat the simplicity of being able to get up and head down to the beach and then along the two mile stretch of sand to Woolacombe. You can also take the paths through the dunes and higher up along the footpath. 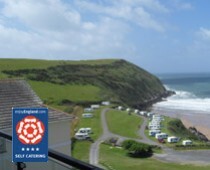 Woolacombe offers places to eat and drink, several small grocery stores and surf/clothing shops. It also has a pharmacy. If you continue round the bay from Woolacombe, you pass through neighbouring Mortehoe and on to the wild headland at Morte Point.